The knitting cards were the first reference card project and, after people saw them, we have had numerous requests for similar cards addressing crochet materials. So, in response to ther requests, we have produced two cards. For those not familiar with the principal behind these cards, when you read a period crochet pattern there is often confusion as to what size thread and hook to use and some patterns don’t even include either the thread or hook sizes (you're just supposed to know). Even when they do include such information, it is in 19th century terms and not modern crochet terms. These cards, like the knitting reference cards, have been designed to make things easier for those who are translating period patterns for modern use. The first card has images of actual sized crochet cotton and pearl cotton threads which were taken from Encyclopedia of Needlework by Theresa de Dillmont. On the reverse side is a general listing of crochet items with the suggested thread and hook size. The latter was taken from Beeton’s Book of Needlework. One can easily take modern crochet threads and compare them to the period image in order to obtain the correct sized thread. The second card is a comparison of bell gauge sized crochet hooks with the American and Metric equivalent sizes. Prices: $3.25 per card or $5.75 for both. 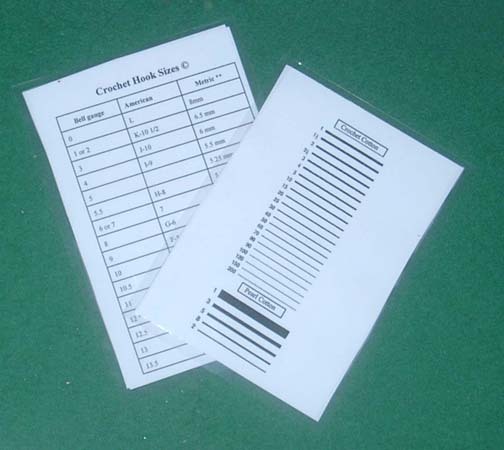 When ordering, be sure to specify whether you want the Crochet Thread Card, the Crochet Hook Sizes Card, or both. Special shipping rates for the crochet cards. If you are ordering only the crochet cards (or knitting cards in the same order as the crochet cards), the shipping rates are $ .75 for a single card or a set (two cards, one of each). If you are ordering multiple cards or sets, please include $ .75 for every two cards. The cards will be sent via First Class mail, rather than Priority Mail. This cost includes both shipping and handling.